TOPICS:Daniel HirschelDaniel Hirschel AttorneyHirschel Law Firm P.C. Valley Stream, NY WW/Press/January 18, 2016 –Daniel Hirschel, Attorney at Hirschel Law Firm, P.C., was selected for inclusion in the forthcoming Top Attorneys of North America 2015-16 edition of The Who’s Who Directories. The accomplishments attained by Mr. Daniel Hirschel in the field of Legal Services warrants inclusion into the Top Attorneys of North America. Daniel Hirschel has been representing policy holders and property owners for more than ten years. In that time he has developed a reputation in the legal community as a lawyer unafraid to take the fight to the insurers. His areas of practice include insurance coverage litigation, business and commercial law, land use and zoning. He received his J.D. from Yeshiva University Benjamin N. Cardozo School of Law and is a member of the New York State Bar. Daniel was also selected to the New York Metro 2014 and 2015 Rising Stars. 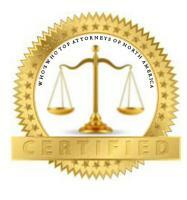 Be the first to comment on "Top Attorney – Daniel Hirschel"